Patrons of the sold-out Bermuda Jazz concert at the Earl Cameron Theatre certainly got their money’s worth. Tony Bari put together a line-up of local musicians and vocalists who put it all on the line for an appreciative audience. The first set started with Tony’s virtuoso piano accompanied by the rock solid rhythm section of Stan Gilbert on bass and Ronnie Lopes on drums. With clever arrangements and great use of dynamics, the trio set the bar high early on, weaving together music by Andrew Lloyd Webber, Cole Porter and Van Morrison in a theme of night music. Conrad Roach joined the band on stage for two numbers by the trumpet legend Dizzy Gillespie including the classic Night In Tunisia, and his crystal clear tone and tasteful choice of notes added another dimension to the performance. The quartet then gave a master class in swing with Woody Herman’s classic Four Brothers. Next up was one of Bermuda’s favourite vocalists, Gita Blakeney-Saltus, who did a great job with a variety of styles from ballads to bossa nova to swing. A standout was her soulful, bluesy rendition of Black Coffee. By the time the intermission came around the audience might have thought they had already seen a full show. After the break the Tony Bari trio welcomed another of Bermuda’s top vocalists, Sheila Smith, who immediately let the audience know that the evening was still building. She combined her naturally powerful voice with the ability to sing sweetly, and of particular note were her rendition of the ballad My Funny Valentine followed by her swinging with the band on Ole Black Magic. The band Spirit joined Tony on stage and brought the funk. 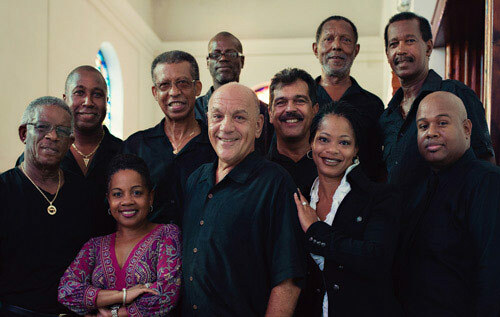 Beginning with their version of the jazz standard Stella By Starlight, Earl Leader demonstrated his vocal talent as well as his well known ability as a drummer and percussionist. In addition to Earl, Spirit comprised Tony Bari on keyboard, Derrick Simmons on guitar, Dennis Francis on bass, Jade Minors on tenor sax and Denton Leader (yup, Earl’s younger brother) on drums. With two Leaders in the band — well, let’s just say the pocket was big enough for the whole band to sit in. Tony showed his versatility crossing over into the funk genre, Derrick’s tasteful Benson-esque guitar fills provided additional colour, and Jade Minors’ unique tenor tone stood out on a Grover Washington tune while Dennis helped anchor the rhythm section. Heads were bobbing throughout the theatre to a set that was reminiscent of a night at Hubie’s Bar. Toward the end of the set, the band featured a percussion and drum solo between Earl and Denton on Stevie Wonder’s Don’t You Worry ‘Bout a Thing that practically brought the house down. The finalé brought all the evening’s musicians back on stage to close with the Earth, Wind and Fire song, That’s The Way Of The World. From start to finish this night was special, and it was one of those times that made you appreciate the quality of talent available in Bermuda. The Bermuda Festival should be commended for providing an opportunity for local talent to shine — and shine they did.